David Archambeau/Daily Mining Gazette Michigan Tech’s MacAuley Petersen goes for a hit Thursday during the Keweenaw Classic against Mary at the Wood Gym. This summer, I had the opportunity to sit down with each of the four incoming freshmen from the Michigan Tech Huskies volleyball team. I interviewed each person for about 25-30 minutes and then ended up conversing with them for another 20-25 minutes each. I was struck by one thing about all of them: they are all impressive individuals. I don’t mean that they are impressive athletes. Of course they are, they are setting out to play college sports, they have to be impressive athletes. I mean that they are all well-spoken individuals. Each of them knew they had flaws in their game, and could name those flaws immediately. Each of them had a personal goal they wanted to strive for. Each of them knew their strengths and had worked to make sure that they were not just what they do best. 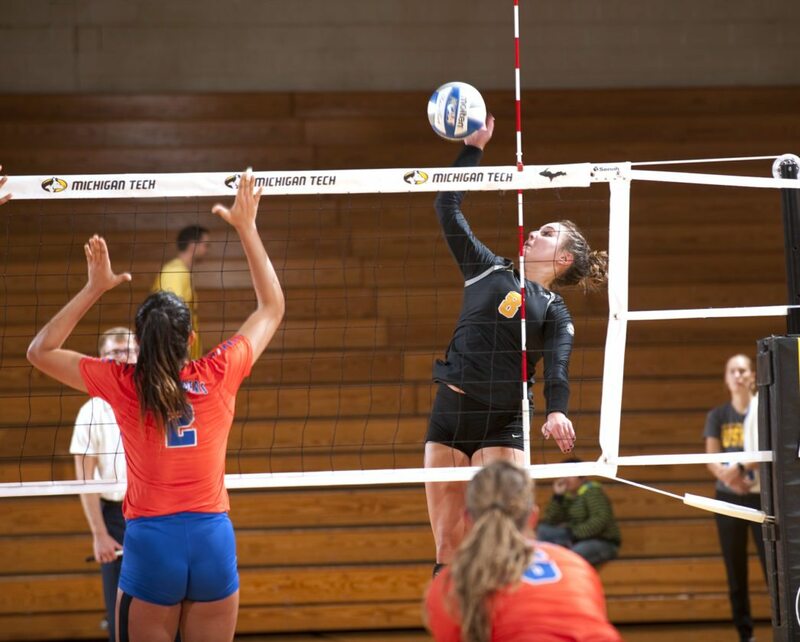 This past weekend, fans of the volleyball program had the opportunity to see the quartet live as the Huskies hosted the Keweenaw Volleyball Classic, the fans showed interest in droves. I fully admit that I did not get a chance to see any games in the tournament until Saturday night’s matchup with the No 7 Minnesota-Duluth Bulldogs. In other words, I missed out on Friday night’s five-set classic match with the St. Cloud State Huskies. I was not one of the 840 in attendance. I arrived significantly early for the match against the Bulldogs thanks, in part, thanks to the match prior between St. Cloud State and Lake Superior State, which ran a bit long. Since my mother came with me, since she was also interested in seeing the 2017 Huskies, I had a few moments to myself while she tracked down a ticket. I took the opportunity look around the Wood Gym and discovered head coach Matt Jennings sitting off by himself going over some last-second details before addressing his team. I ran up the stairs to visit with him and he told me about how loud the gym had been Friday night and how exciting the match against St. Cloud State was. We also talked about the freshmen class, since it was already clear to me, just by looking at the team stats, that at least half of them had made an impact through the first seven matches of the season. Over the course of the match against the Bulldogs, all four played, with three of them playing a significant amount, sometimes, especially in the third set, at the same time. Imagine that, the Huskies having three freshmen on the floor at the same time against a top 10 team in the country. The reality was, all four made an impact. In the end, the Huskies lost, but the team showed a tremendous amount of promise. Olivia Ghormley tied for the team-high in kills with seven. Laura DeMarchi had 31 assists, four kills, six digs, one block and several smart serves. The two coming off the bench, Anna Jonynas and Megan Utlak, also had moments to shine throughout the match, including a point where Jonynas twice laid out to one side or the other to get a dig, and another where Utlak chased down a ball that the Bulldogs’ players assumed was out of reach and had quit watching closely. When Utlak put the ball back in play, the Huskies nearly caught the Bulldogs napping. Add to this fearsome foursome the fact that outside hitter MacAulay Petersen, who leads the team in kills, is a sophomore, there is plenty of reason to believe that the best is yet to come for the Huskies. Already this season, the Huskies have gone from losing matches 3-2 to winning them 3-2. As they continue through the GLIAC portion of their schedule, there is no reason to believe they cannot continue to build off of what they have already accomplished and continue to build towards that team goal of hosting a GLIAC tournament game.